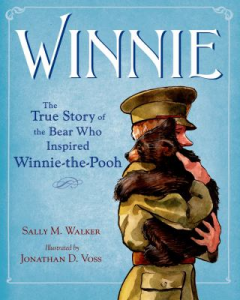 I sque aked with joy when I saw this book on Booklist Reader : Winnie: The True Story of the Bear Who Inspired Winnie-the-Pooh by Sally M. Walker. Although it’s a children’s book, it appealed to me because of the cover art of a bear snuggling with a soldier and my abiding affection for Winnie the Pooh. It all began in 1914, when Canadian Army Veterinary Corps lieutenant saw a man with a baby bear at an Ontario train station. Harry Colebourn bought the bear and brought her to the army training camp in England. Bear and man became fast friends, and gentle Winnie turned into the camp’s mascot, marching with the soldiers and sleeping with Harry. When the troops went to battle, however, Harry gave Winnie to the London Zoo, where it entertained children and was so docile it let them pet him. One day, author A.A. Milne was at the zoo with his son,Christopher Robin, when they met Winnie, and literary magic was born. Milne went on to write the very appealing Pooh stories, and children today still love Winnie the Pooh. How delightful! I cannot believe I didn’t know Winnie the Pooh’s background story. If you like this book you should defiantly watch the movie. You can get it at the library. Its called A Bear Named Winnie. It is a wonderful movie, and is in keeping with the real story. We loved it!